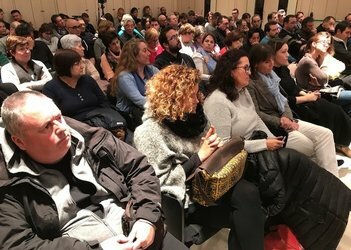 At 8.00pm this evening, March 13, members of the Consell d'Entitats, the island's coalition of community leaders, congregated for a special session to discuss questions which might have emerged following the group's last gathering. When members last met on Wednesday, March 6, they saw the unveiling of the proposed plan to manage entry, circulation and parking of vehicles on the island. The initiative is an outgrowth of legislation for Formentera's environmental and financial sustainability. Mobility councillor Rafael González gave an overview of the proposed plan and answered questions from attendees. Put to a vote afterwards, the measure won the support of the Consell d'Entitats. The proposal will be voted on when council members gather for their full March assembly. Pending approval, an educational campaign will be implemented in early April with an online portal to follow later in the month, the goal being to carry out regulation between July 1 and August 31. The Consell d'Entitats, the island's league of associations, held its regular meeting yesterday evening at 8.00pm in the conference room of the CiF, next to the Centre de Dia. Among the items on the day's agenda was the third round of pressupostos participatius, or “participatory spending”, to involve islanders in decisions about which projects receive money from the administration. Citizen participation councillor Sònia Cardona presented the results of the projects that were voted on by the 34 participating groups. The Council had set aside €325,000 to fund the five top projects and the first phase of the sixth on the list. 1. Safety improvements at pedestrian crossings. Involves setting up sustainable lighting at crosswalks. With an estimated €40,000 price tag, this project was suggested by residents of es Caló. 2. Water fountains at local schools. Proposes putting a drinking fountain in each school so pupils can have access to water without having to use plastic bottles or drink processed refreshments. The AVIF-proposed initiative has an estimated cost of €10,000. 3. Improvements at la Savina children's park. Entails upgrading the gates around the park so toddlers at play can't get out without help from an adult. Upgrades to the rubber flooring and lighting are also planned, as well as switching out the pétanque area for a specialised area of park users' choosing. This improvements proposal was put forward by la Savina's neighbourhood association and would cost an estimated €50,000. The initiative proposes specific measures, included in the island's strategic action plan for youth, to promote leisure. The APNEEF's proposal has an estimated €75,000 price tag. Envisions enlisting two metal gates at either end of the school to block vehicle traffic and link the two distinct areas. Mestre Lluís Andreu's parents' association came up with the proposal, which has been allocated €25,840. Only the first phase of this project will be programmed because its full implementation would push total spending into the red zone. This €175,000 project was proposed by es Caló's neighbourhood association and will receive any money left over after the first five are budgeted for. Councillor Cardona drew attention to the diversity of groups behind the projects ultimately selected, pointing to “neighbourhood groups, parents' associations, groups working for social change”. She also highlighted the fact that this time around, the winning projects were those with smaller price tags. “These are initiatives that are important for a broad range of islanders”, she said, while declaring that the priorities—environment, youth, education and road safety—“are ones we can be proud of”. 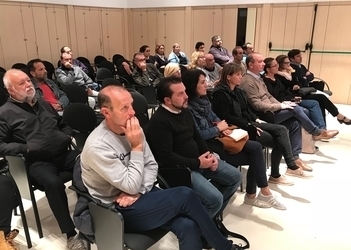 Lastly, tax office councillor Bartomeu Escandell gave attendees a first-hand look at the projects on the horizon during the year ahead by unveiling the Formentera Council's 2019 budget. The Formentera Council held a town hall-style gathering Wednesday evening for the presentation and review of participatory budgeting for 2018. Chaired by two CiF secretaries—Sònia Cardona, of citizen participation, and Rafael González, of the infrastructure and mobility departments— the session got started with a progress report on participatory budgeting projects from last year. Of the 2017 initiatives, the planned children's park in Sant Ferran is on track for completion in summer of next year, while plans to equip the town with a fitness circuit are facing delays due to multiple land transfers required to move forward. Work will continue on both projects, which will be rolled over into the 2019 budget. The ensuing presentation featured a round-up of the 26 initiatives from last spring, most of which fell into the categories of sport (30%), youth and social services (30%) and environment (21%). The various projects, brought last year by roughly a dozen local groups, included road improvements in Es Caló and on the stretch of road connecting Sant Ferran and Es Pujols; a skate park in Sant Francesc; water fountains in public schools; a climbing wall in the Marc Ferrer high school's sports structure; a children's park in La Mola; wastebins equipped for recycling; crosswalks with enhanced safety features; and a unification —by installing metal gates to block vehicle traffic—of the distinct buildings of Mestre Lluís Andreu primary school. Projects considered viable (approximately half of all those presented) will be passed along to the Consell d'Entitats, or Council of Entities, for review and ranking. Member groups have until December 10 to vote on projects and decide which make the final cut. 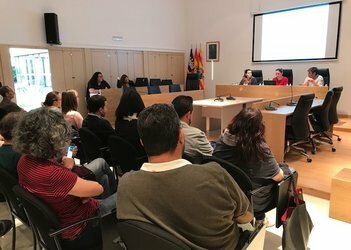 Yesterday in the conference hall of the island's dependent care centre, the Formentera Council called together the economic, neighbourhood, tourism and environment sections of the local league of community leaders to debate a liminal version of a measure to reshape zoning and create what is being called Formentera's “ceiling on tourism”. Attendees at the encounter represented a wide slice of local social and associative strata. 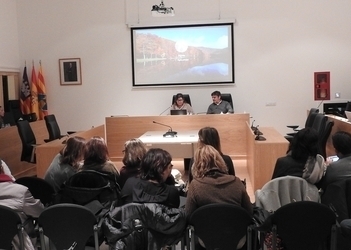 Findings of recent research were communicated to Consell d'Entitats attendees by land secretary Alejandra Ferrer. The figures provided insight as to what portion of Formentera's population could be considered actual “residents” (13,345, according to the municipal register) and where to position the island's populational tipping point (between thirty-eight and forty-two thousand inhabitants during three to four months) when short-term and long-term residents are counted together. Approximately 14,500 beds have been green-lighted for rental using the established legal channels, while estimates suggest another ten to twelve thousand might exist. Based on those figures, and as part of a two-pronged effort, not only to place limits on lodging for vacationers so that year-round residents can be guaranteed housing themselves, but also to ease the strain that the island's summer boom places on people and resources, the Council proposes licencing five thousand beds of the twelve thousand today commercialised without permits, effectively drawing a line in the sand for tourist-use beds at 20,000. Council officials say the permits would be distributed across multifamily residential buildings in es Pujols, la Savina, es Caló, es Ca Marí and rural areas. According to Ferrer, the additional five to six thousand permits would mean “regulation of 50% of the rentals which are currently off the books”. The proposal hinges on the notion that certain traditionally residential neighbourhoods—Sant Francesc, ses Bardetes, Sant Ferran and la Mola, for instance—would stay residential. This is all the more significant because, in the secretary's words, the neighbourhoods in question tick all the boxes for family housing, “not to mention represent important avatars of local identity”. “What this really is,” Ferrer confided, “is a model that will let Formentera re-establish a balance between economic activity which is necessary and our residents' quality of life”. The proposal was discussed at length. While various concerns were voiced, there was general consent surrounding the need to cap tourist-use rentals if Formentera is to maintain its status as a quality destination. 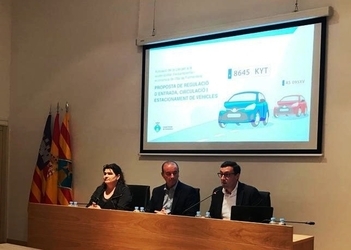 At the close of the session, secretary of community participation Sònia Cardona indicated local groups would soon have access to the abovementioned research data in its entirety, enabling people to draw their own conclusions. Ensuing proposals will be considered in forthcoming sessions of the tourism planning commission. Those proposals, in turn, will feed into a final proposal, presented and debated at the Consell d'Entitats' plenary assembly. The Formentera Council will convene the economic, neighbourhood, tourism and environment sections of the island's league of community leaders on Monday, May 14. During two evening sessions at 8.00pm and 8.30pm, sectorial groups within the Consell d'Entitats will be brought up to speed on the raw data and conclusions behind the administration's planned tourism zoning project. The initiative stems from the July retooling of regional legislation on tourism, which lets the island councils set their own “tourism ceilings” (sostres turístics) fixing the maximum number of overnight stays allocated for holidaymakers. The law also gives local administrations a say defining where multi-family tourist rentals are permitted and where they are not. The Council's committee on tourist zoning, or COT, announced the news today. Issues and proposals that arise from the sectorial gatherings will be picked up at future COT meetings. Ultimately, the full Consell d'Entitats assembly will convene to review and debate a final proposal. CiF land, tourism and trade secretary Alejandra Ferrer and Sònia Cardona, her counterpart in citizen participation, called the plan “strategic”. Citing the potential of changes to impact the immediate future of the entire island, the two women called for “cool-headed reflection among the most possible stakeholders” and encouraged members of the associated sub-groups to “come get a first look at the Council's earliest proposals and the reasons behind them”.